By storing important records and items in the storage envelope. 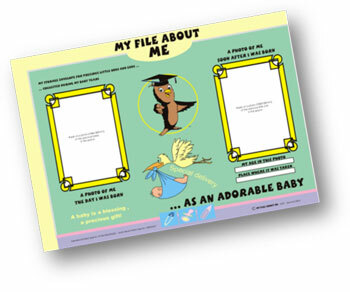 Use the A3 Multi-purpose plastic sleeves, A3 mounting inserts and decorative paper. Use these items to acccommodate all info from pre-birth including the toddler years. Display a variety of mixed media as your heart desires or your time permits in the order that you wish. So many treasured moments to cherish all inONE safe place. Create a gallery of your child’s entire life. 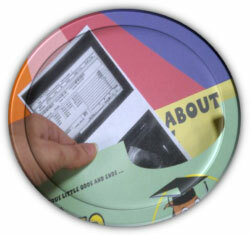 Record the info that you have time for, without the worry of having blank spaces. 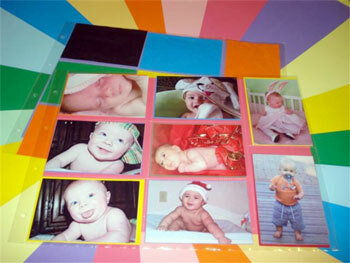 Use our jumbo photo sleeves that display SIXTEEN photos on one page. 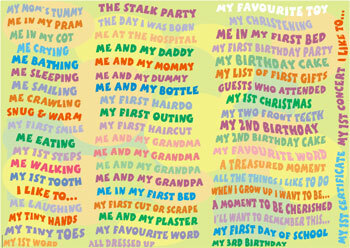 Sixty stickers from pre-birth up until the third birthday are delightul guides for photos. This extra strength, strudy, glossy box and file set will compact a lifetime of work in one condensed system. 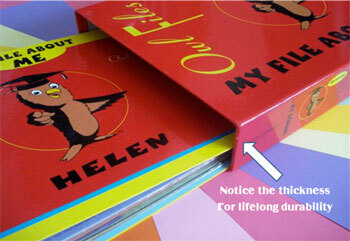 Let us personalise your childs name onto the box and file. 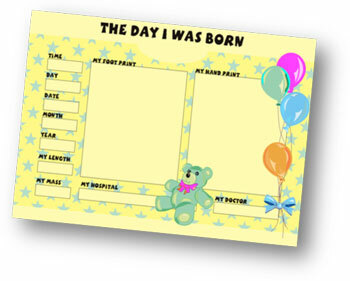 You already have your box and file, now simply add your nursery school section on with more accessories.